Put simply, the Superbook feels like it's still in pre-alpha. The setup process is extensive and complicated, it's buggy, and the hardware has all the worst hallmarks of the netbook era. I can't in good faith recommend that anyone purchase the Superbook, especially in its current state. This product wasn't ready for market, and probably won't be for a while yet. Initially, we were offered an advance Superbook unit for earlier review, but the representative from the company we were speaking to went silent earlier this year. As a result, I'm not entirely sure if the model which I received was a review unit or the upgraded version that I backed in 2016. Either way, our review is for the slightly more expensive, premium 1080p/backlit keyboard model, which runs $200. I'm also told that original backers are being upgraded to this model as a result of the project's delays. Price $140 for the base 768p model, $200 for the 1080p model. Screen High-resolution display for cheap. 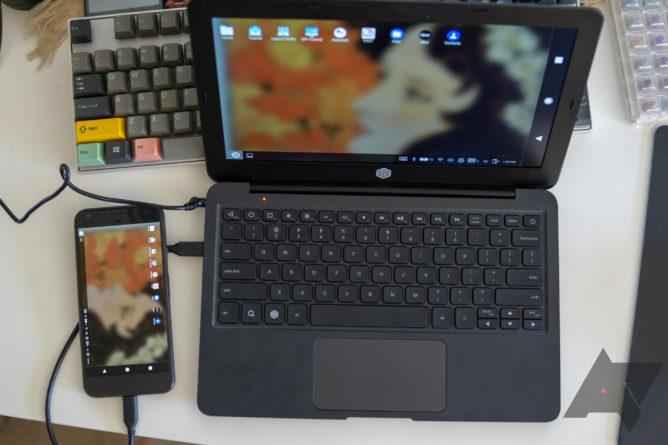 Concept Your phone as a laptop is a really cool idea. Build Quality It creaks and flexes terribly, worse than the worst netbook. Charging Can't take power over USB-C. Included cables The Type-C cable it comes with is low quality and prone to disconnect. Buggy See my extensive list of strange behaviors. Poor performance I expected it to mirror the level of performance of the connected phone, but that didn't seem to be the case. Plenty of dropped frames and lag. Setup process Getting everything working, for me, wasn't even possible, but the steps required to get that far are extensive and tedious. Your average consumer shouldn't be forced to use ADB to get something to work. Screen You get what you pay for. That high-res screen has terrible backlight bleed. 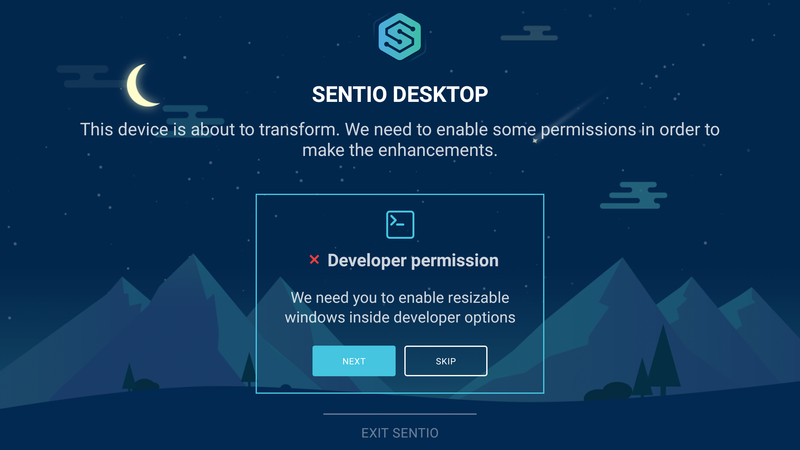 Software Sentio Desktop (the companion app/interface) often blocks interactive elements and doesn't play nice with a lot of apps, among other problems. I tried to dance around ways of saying this, but I have to be honest. There's nothing positive to say about the Superbook's build quality — apart from maybe the pleasant texture of the keyboard's keys or the high DPI screen (and even it has a bit of backlight bleed). 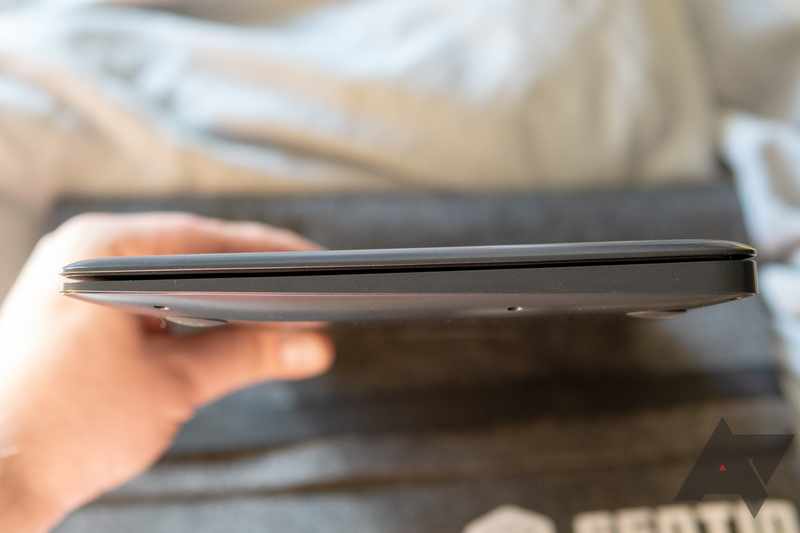 The Superbook feels incredibly flimsy and flexible, creaking (almost grinding) loudly when you pick it up while it's open. Imagine the very cheapest netbooks from the pre-tablet era, but worse. 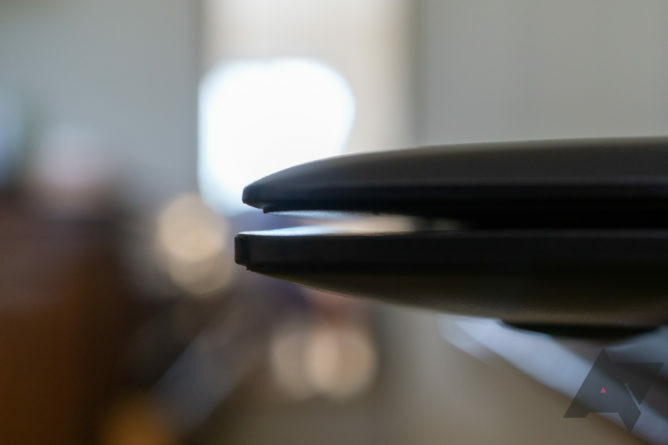 I am legitimately concerned when I touch the Superbook: You can feel the plastic base and deck sliding into different relative positions in your grip, and the whole device has a tendency to warp itself if you pick it up, throwing off the alignment of the lid when you close it. The Superbook is actually closed, here. This gap is from the alignment of the different panels adjusting after being picked up. The Superbook looks almost precisely like a ~5-year-old ASUS netbook. According to my calipers, it's around 0.8" at its thickest point (excluding the bumps for the feet), and 11.4" x 7.4" from above. 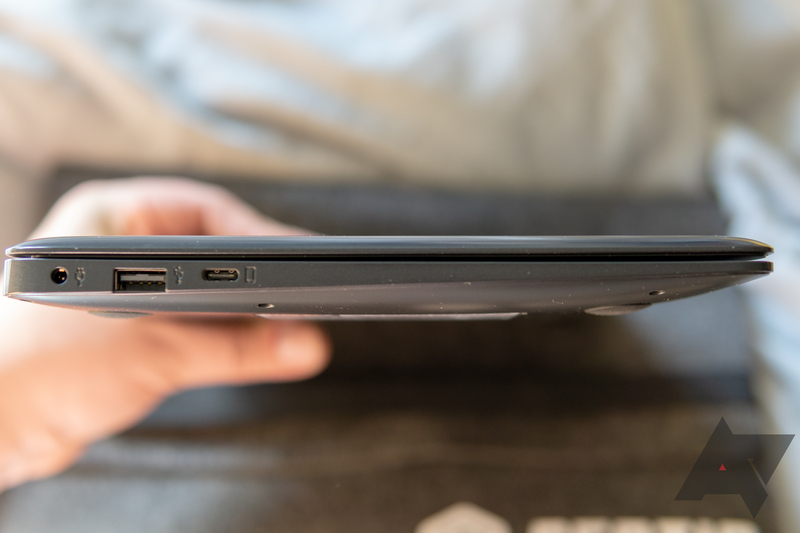 All the Superbook's ports — barrel connector for power, USB-A, and USB-C — are on the left edge near the back. The front, right, and back are bare. 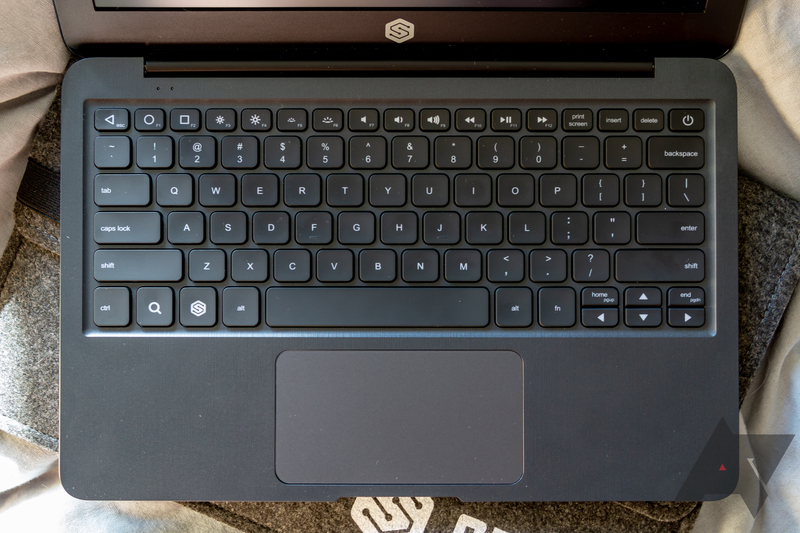 The Superbook's semi-gloss finish is prone to pick up fingerprints, as is the matte surface of the keyboard's keys. 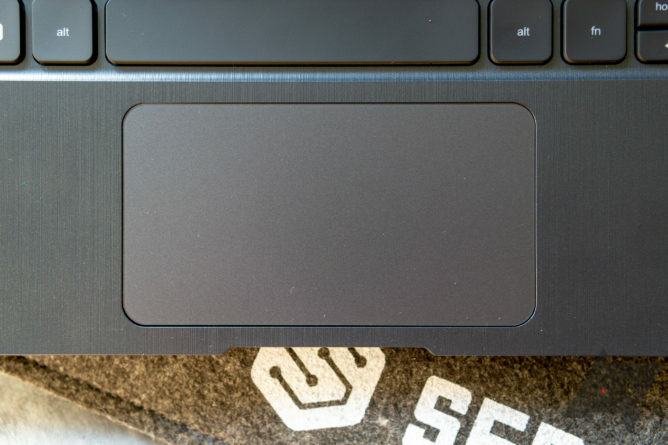 The keyboard deck has a fake brushed metal texture that looks and feels pretty cheap, but it seems to be durable, fingerprint resistant, and easy to clean. The touchpad is pretty terrible. Latency is high, and it's just not very accurate with a tendency to stutter. Remember the really mediocre touchpads most Windows laptops had like 10 years ago? This is worse than that in general performance. It lags out often, sometimes mouse acceleration goes a bit haywire, and it'll just randomly click as I'm moving the cursor around. The touchpad has dedicated areas for left/right click at the bottom corners, with separate physical switches beneath for each. The cursor has a tendency to jump around when you push in to click, so tapping is probably a better idea. It also doesn't have much in the way of palm rejection while typing. The keyboard isn't quite so bad, but it's still not good. Key travel is decent — if a bit mushy. The issue is that sometimes the keys just don't work or pass input when they're pressed. That means you have to slam down pretty hard to make sure it picks up what you're typing. In tests, I would frequently get an abysmal error rate due to missing characters. Going back to correct every omission dropped my typing rate to ~60WPM (I can usually hit 100-120). Keys are the right width (16mm) for comfortable use, though they are not as tall as they should be on a full-size laptop keyboard (~13.5mm vs. 15mm). As a result, I frequently overshot the backspace key and hit delete or the power key. Unlike a Chromebook, all it takes is a single tap of the power key to turn the Superbook off, so that's pretty obnoxious. Turning it back on is a whole thing: After you hit the power key, you have to unplug the phone and plug it back in for the Superbook to recognize it — or, at least, I had to. Altogether, what is a minor keyboard problem turns into a pretty major interruption in workflow if you make that mistake. 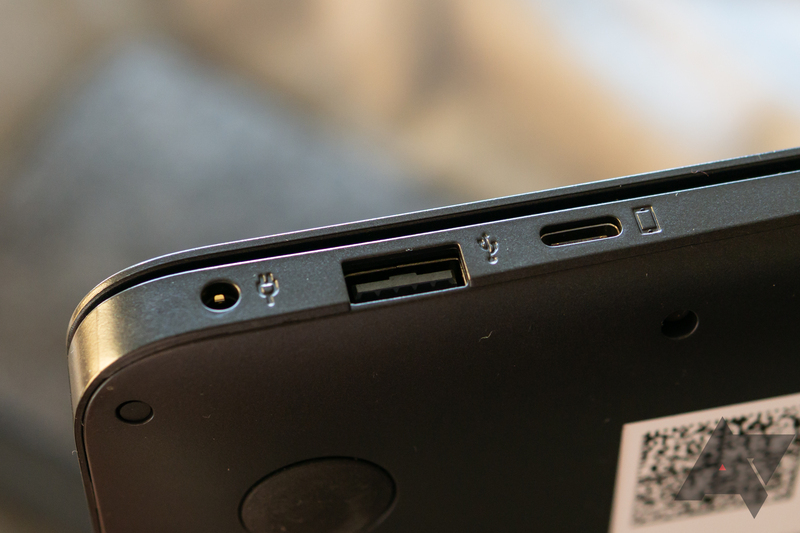 If you don't pop for extras, the Superbook just comes with the laptop/hardware itself, a cable of your choice, and a beefy barrel charger — that's right, there's no charging over USB Type-C. For extra cash, you can get more cords and a mount for your phone on the side of the screen. Early backers on Kickstarter also got a felt sleeve, but you won't be missing much without it. The USB Type-C cable that's included is pretty flaky. I don't know why, but it has a tendency to work its way out of the ports on the Superbook or your phone pretty easily. Considering you have to flash firmware updates over USB-C, that means you need to be very careful when you're doing that, or use a better cable. 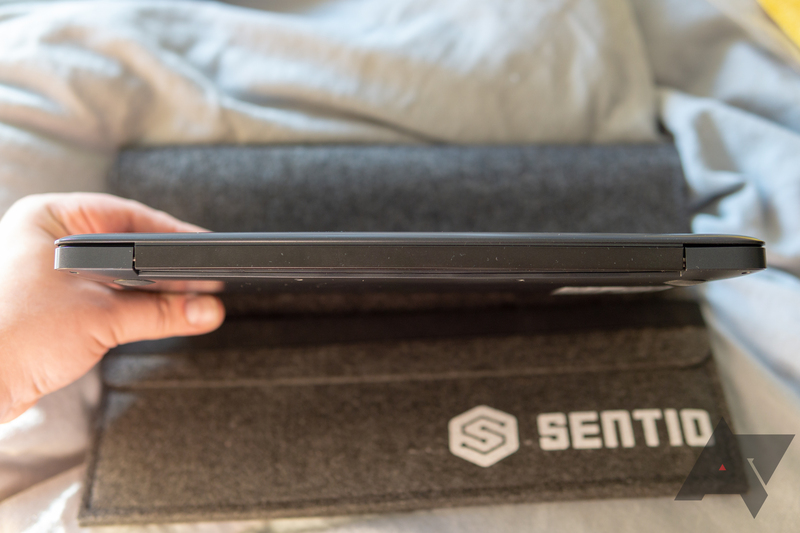 Configuring the Sentio Superbook to work is a serious undertaking. In Sentio's own three-part walkthrough documentation the company itself calls part of the configuration "tedious," and that's an understatement. 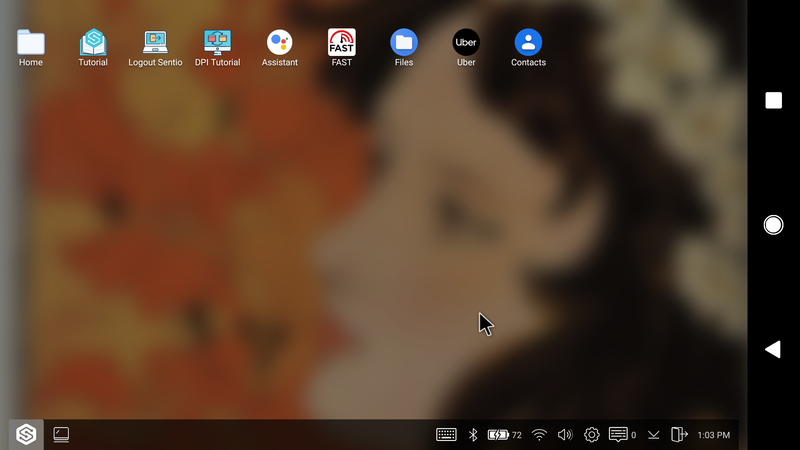 Including firmware updates, you need a total of three apps to use the Superbook (four if you count the optional file explorer), and if you aren't using an old version of Android, you'll also have to muck about in ADB and developer settings. In all, getting everything set up on my first-generation Pixel XL on Android 9 Pie took around an hour. 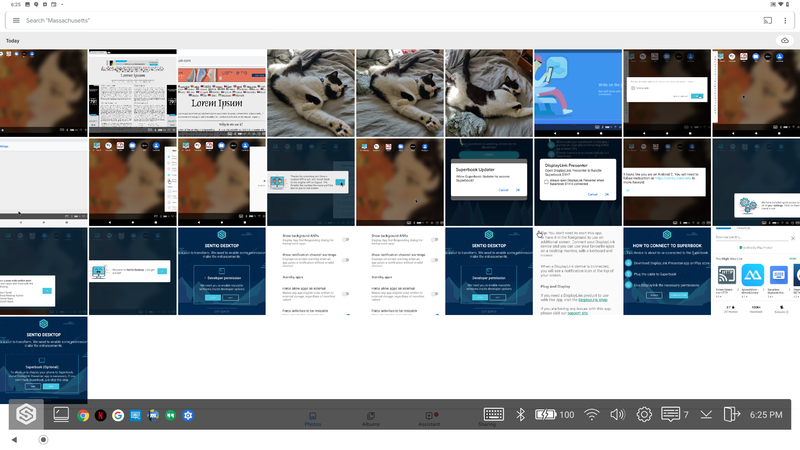 The biggest issue I ran into was multi-window/resizable activities. No matter what I did, the Superbook's companion app couldn't detect that I'd made the change to enable multi-window mode in Developer Options. 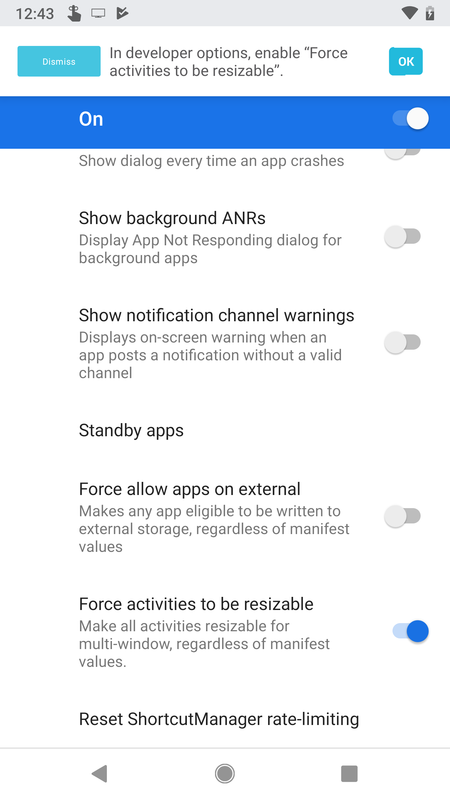 Separately from the Developer Options setting, Oreo users have to follow an additional set of instructions entirely, requiring that you change settings on your phone via ADB. 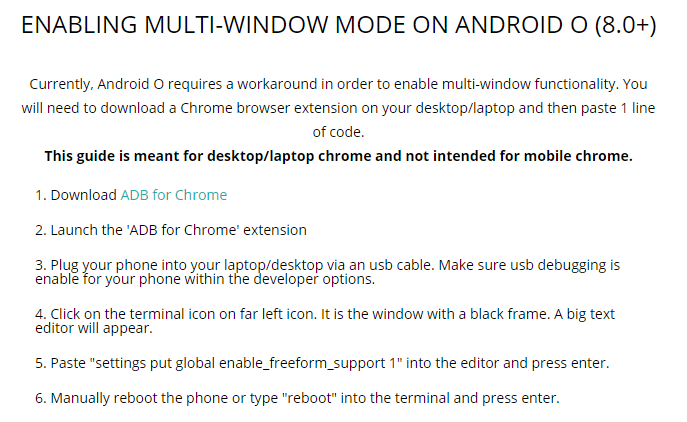 Telling the average customer to go through the process of enabling USB Debugging, installing ADB drivers or the ADB chrome extension, and then mucking about in a terminal/CMD window probably isn't a good idea. 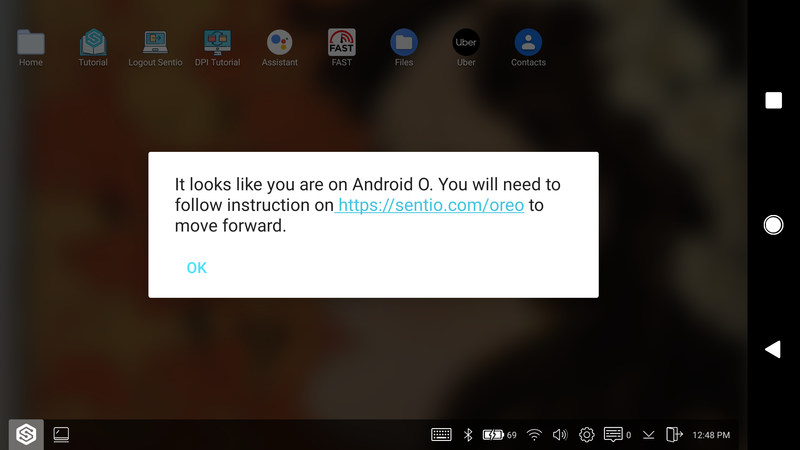 I spoke to Sentio CEO Andrew Jiang about this and other problems, and was told that Android P has a bug in how it implements windowing, and the company is currently working through that. Unfortunately for the casual consumer, Sentio hasn't updated its site or guides to make that clear, even though P has been in developer testing now for half a year and formally released for two months. Neither the instructions for setup hosted at Medium nor the page detailing multi-window support for Oreo mentions P support or lack thereof. I also tried testing it with the only Oreo device I had access to at the time (a OnePlus 3), and still couldn't get windowed apps to work, so YMMV. 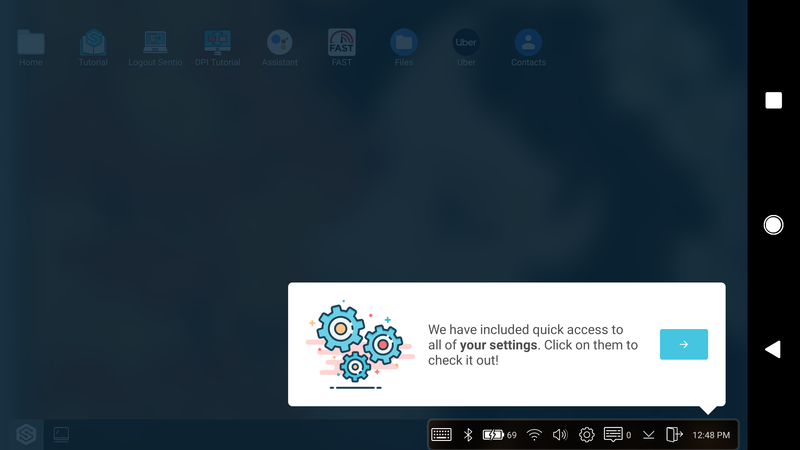 Others have reported success on Oreo, but the setup process for the Superbook is so complicated I really have no way of knowing or telling if or when I've done things correctly short of it not working. To be honest, rooting and ROMing a phone is an easier process than setting up the Superbook. Pretty chunky text without DPI scaling (above), better with it cranked (below). 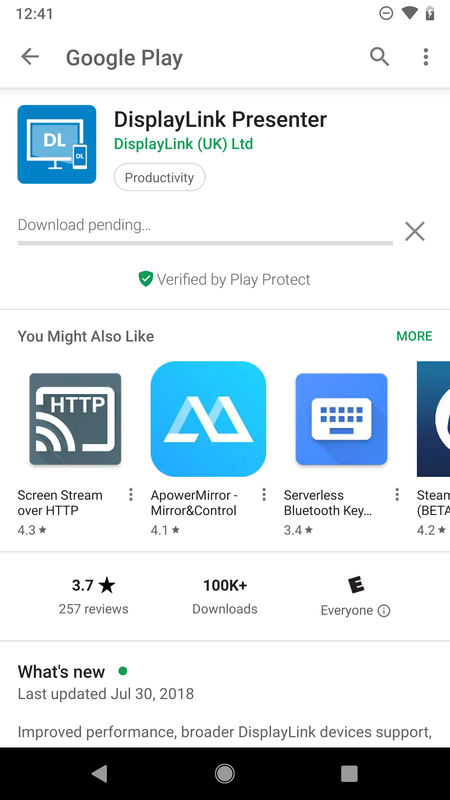 You have to go through a similar ADB process to enable Sentio-specific DPI configurations for apps — and you'll need to. 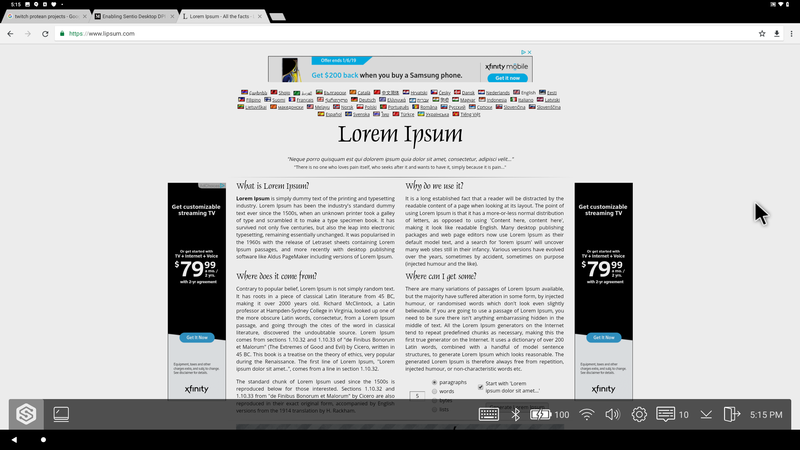 Default phone scaling is way too big for the laptop's screen unless you're trying to read from across the room. Sentio's numbers for DPI scaling are also contrary to what you'd expect, resulting in unintuitive behavior during configuration. 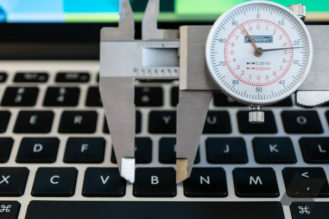 On most devices, like a PC or Mac, a lower number means smaller scaling. For some reason, a bigger number corresponds to smaller scaling for the Superbook. If you dial things down to 100%/1x, you'll actually have the most blown-up proportions of all. Annoyingly, a bit of my Pixel XL's display was always cut off while being mirrored to the Superbook, even with the setting for "change screen ratio to match" enabled. Given both displays shared an aspect ratio, that's pretty unusual behavior. Either the display in the Superbook isn't the resolution/aspect ratio it claims, or something's wrong with how it's chosen to display the feed from my phone. I couldn't tell you why, but those are the apps it placed on the home screen by default. 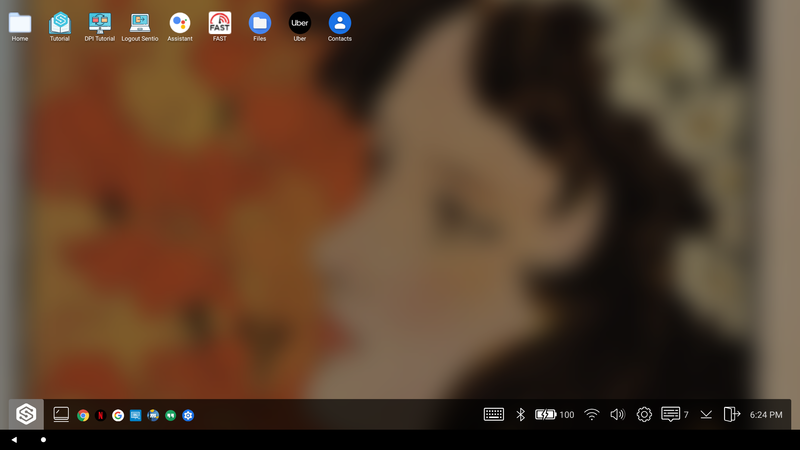 Actually using the Superbook, given the lack of multi-window apps for me, was basically like using a slow Android tablet with a specialized but buggy launcher and no touchscreen, plus a poor touchpad and keyboard. It was functional, but with the previously noted issues in hardware, it wasn't very pleasant. I was able to fire up Google Docs and type a bit or browse around in Chrome, but the terrible touchpad and keyboard kept me from ever wanting to actually continue using it. I was frankly surprised at how poor the performance was. Since it's just mirroring my display, I assumed the Superbook would have about the same snappiness the 2016 Pixel XL has — the Snapdragon 821 is no slouch, even in 2018. Nonetheless, dropped frames abound. It honestly felt like I was using some cheap MediaTek-powered Android device. The Taskbar has two natural states: blocking stuff you need to see or manually hidden and hard to get to. There's no auto-hide, and it can't adjust content to fit above it. Sometimes the cursor was huge, sometimes it was tiny, but rarely did it feel like it was actually the correct size. Frequently when I plugged the phone in, the Superbook couldn't recognize it without restarting the phone. If you set it to dim the phone's display while plugged in, it will occasionally just leave the display dimmed after it has been unplugged. Apps that used DRM, like Netflix, wouldn't display video content for me. Haptic feedback continued while connected to the Superbook. The touchpad would sometimes randomly click while you were moving the cursor. The taskbar overlay was always in the way, or (if manually hidden) was hard to access when you needed it. The taskbar would randomly resize after some apps or activities. The battery state in the taskbar is for your phone, not the Superbook. There is no way that I've found to check the Superbook's battery level, short of the low-battery flashing LED. The taskbar randomly disappears in some apps. Unless your phone's display is native 1080p or 728p, you're gonna have some subpixel weirdness/aliasing artifacts as it downscales to the target resolution. 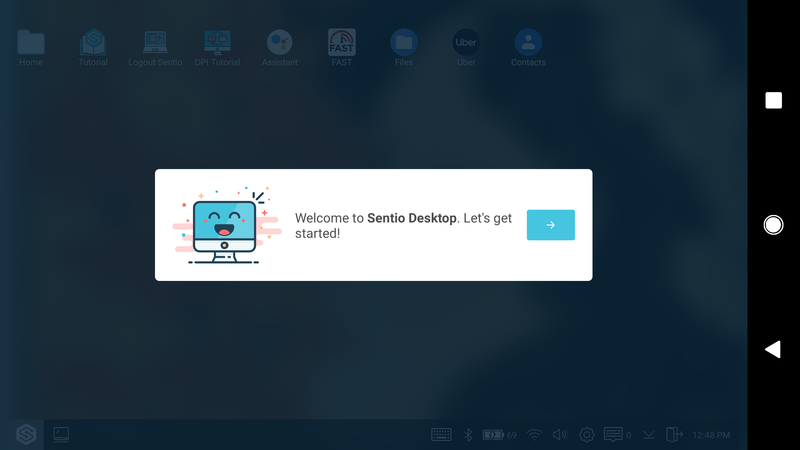 After setting the Sentio Desktop as my default home screen/launcher The Sentio Desktop would sometimes not close when disconnected, rotation would not reset to default settings when disconnected, and DPI would not reset when disconnected. 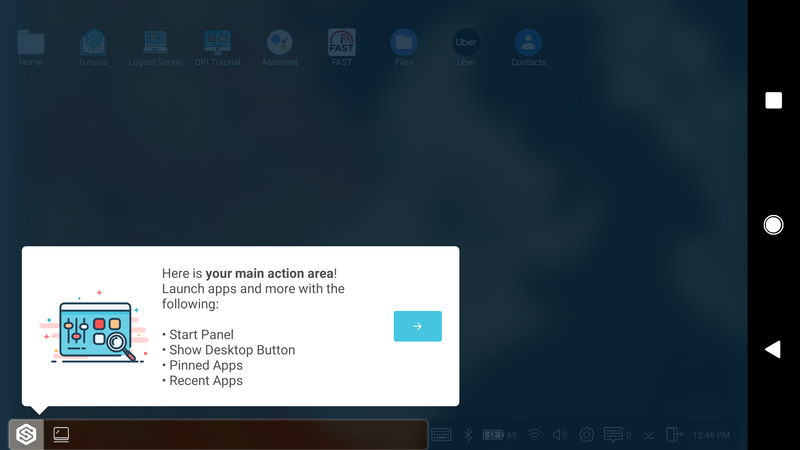 In fact, my default launcher's behavior was pretty much broken entirely, as it was forced into landscape even when not connected to the Superbook, which made the phone hard to use. 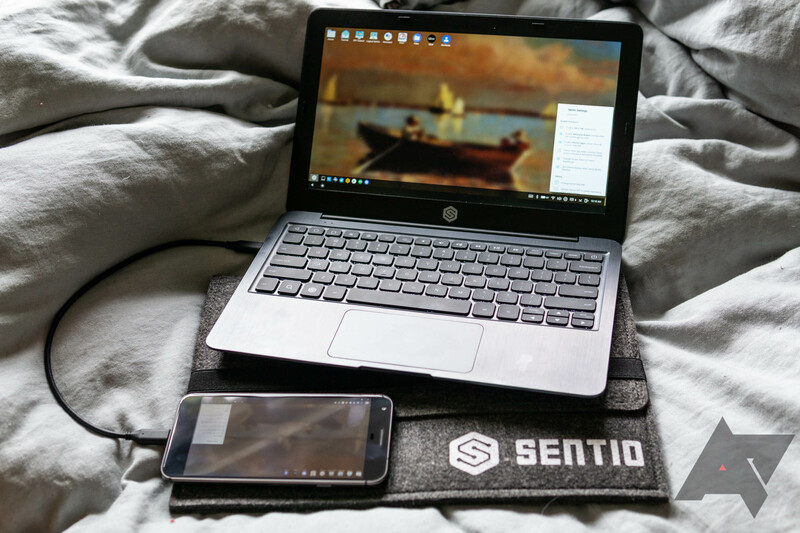 After setting the Sentio Desktop as my default home screen, both software and keyboard home buttons on the Superbook would still take me to the Pixel Launcher. The inability to hide the navigation bar wastes space. To be honest, the Superbook felt more like an exhibition hall demo — the sort of thing I'd half-heartedly play with at an event for a free lunch — than a consumer product. In every regard, from hardware to software, it lacked polish. There's also an overall inconsistency across the software experience using the Superbook. 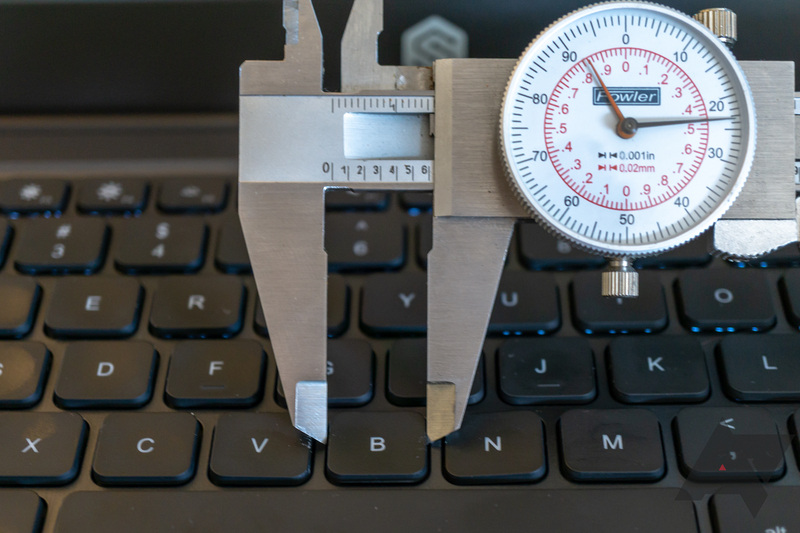 The small stuff is important when it comes to design, and Sentio fails there. 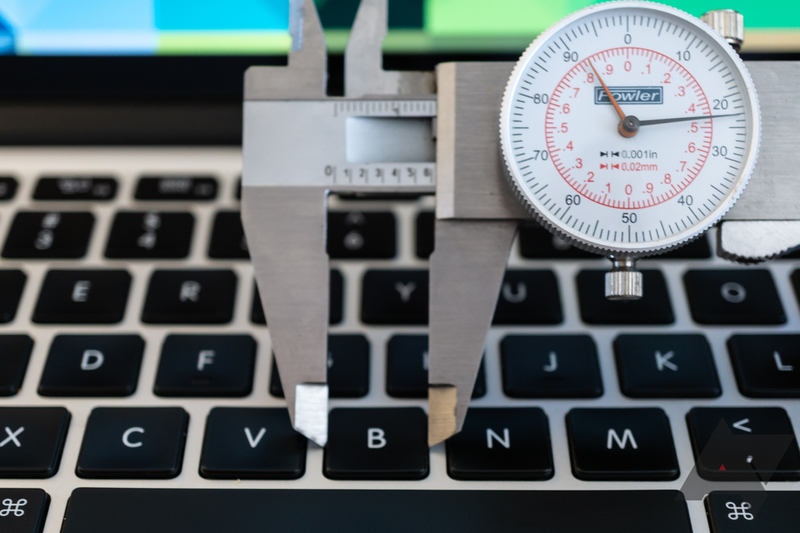 For example, in one place DPI is referred to as a percentage. In another, it's a multiple for scaling (i.e., 250% vs. 2.5x) — again, inverse to every other company's implementation. Padding for text and other elements in the Sentio Desktop app is inconsistent. Keyboard shortcuts are unintuitively assigned: the Sentio icon opens the Assistant, and the search key next to it does nothing. There isn't even an option to invert scrolling, you're stuck with the default Apple-style "Australian" up-is-down configuration. The lack of settings for customizing the Superbook's software experience is laughable. 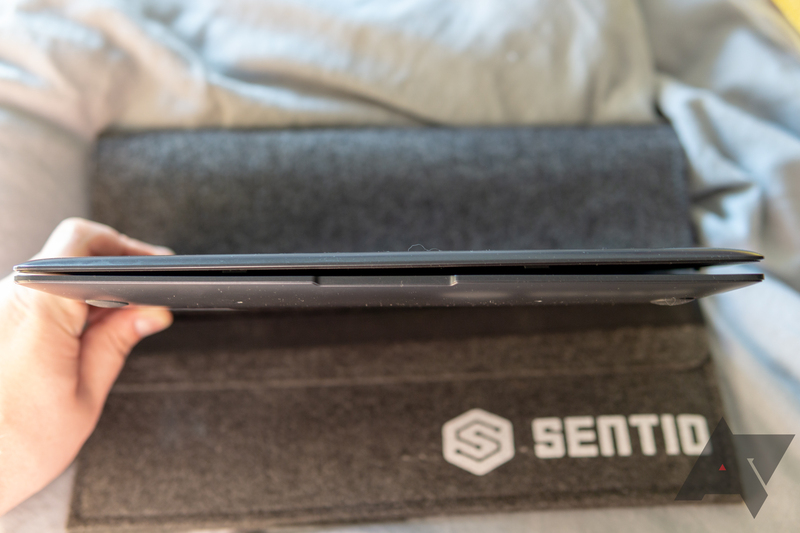 I'm sure that many of the Superbook's issues could be solved with deeper Android platform integration or more/new purpose-built APIs by Google, so the blame for software troubles here doesn't rest entirely on Sentio's shoulders. The source of these problems doesn't change the fact that they're there, though. The "8-hour" claims for battery life seem like a bit of an exaggeration for me, but I didn't use the device from full to empty enough times to be entirely sure of the numbers. I'd estimate my own use brought closer to 4-6 hours of battery life, though YMMV. Any number of factors, including screen brightness, activities, and power consumption of the phone itself could have affected my experience. 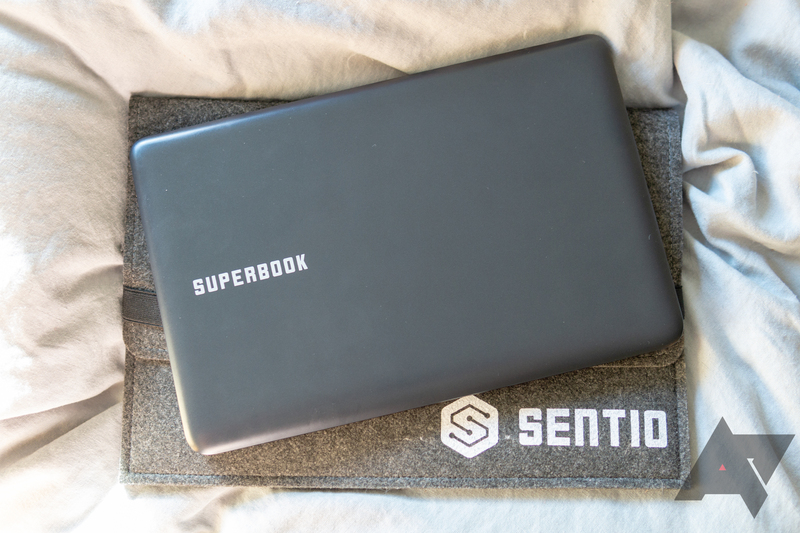 Between the mediocre build quality, overly-complicated setup process, poor overall performance, and general bugginess of the experience, I can't recommend the Superbook. No. I try to refrain from making blanket statements of negativity since there's almost always a niche that a product can fill for the right audience with a particular requirement, but I just don't see that happening here. I even found the humor in an $85 GIF pin, and the Essential Phone has legitimate value for an Android-enthusiast, software-first audience, but I can't rationalize buying the Superbook. In its current state, it's objectively bad and I hope Sentio is able to improve the experience over time, because as things stand this feels like an alpha or pre-alpha release. The Superbook's sole potential redeeming quality is its price: $139 for the base model is very, very cheap. Even so, being cheap doesn't make up for its other shortcomings. 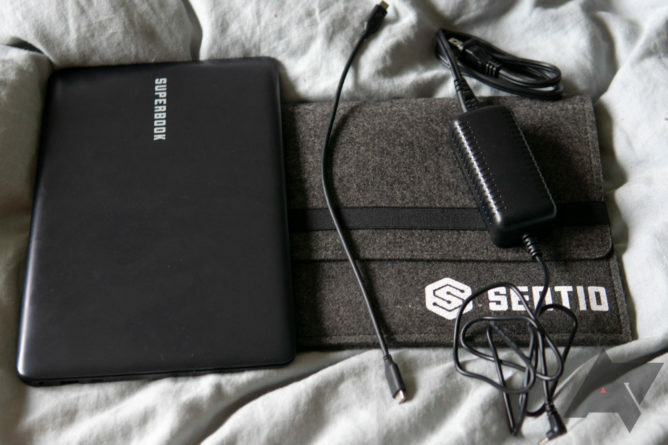 A used, low-end Chromebook (or even an actual netbook) would likely provide a better experience, and there are plenty under $140 on eBay and other deal sites. 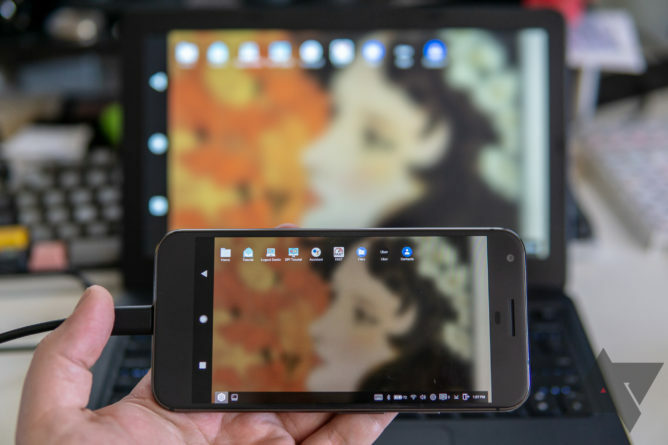 It's possible that having access to your phone's environment is a game-changing experience for your workflow and productivity, but the hardware and software here are still pretty bad. I just don't see anyone having a pleasant time with it. Furthermore, there's the small difficulty of actually purchasing one. 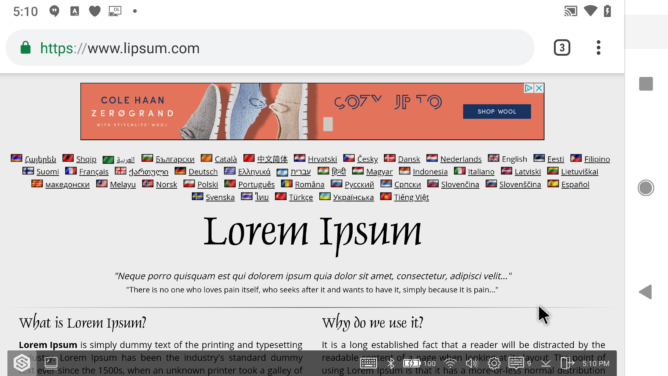 Screenshot taken October 5th, 2018. 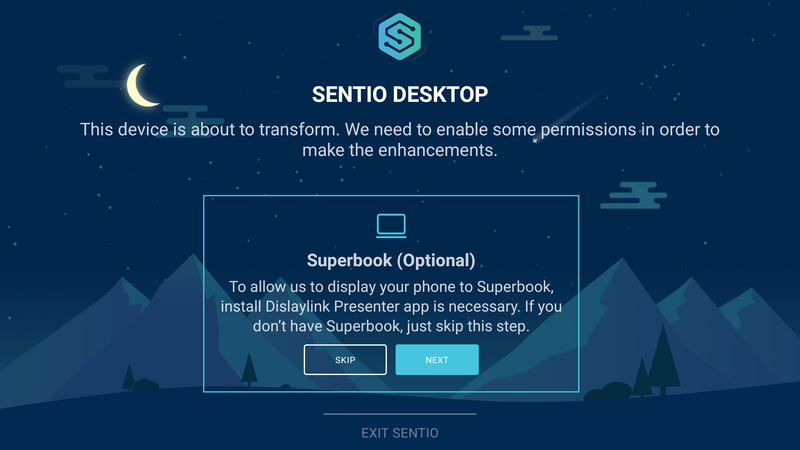 Sentio/Superbook seem to have stopped maintaining or updating whole chunks of their site. In fact, the page to reserve one still mentions April 2018 delivery and sold out batches. That lack of attention to updating site content is concerning. You can actually buy one, but some SKUs are sold out, and Sentio's site isn't so well designed as to tell you that until you try to check out. Because I didn't feel like clicking through all 48 possible combinations, I can't tell you what the logic behind current availability is, but at least a few 1080p and 728p versions can be purchased at the time of writing. Between the mediocre build quality, overly-complicated setup process, poor overall performance, and general bugginess of the experience, I can't recommend the Superbook. It's cheap enough that picking one up for an experiment or as a novelty could be possible if you make enough cash, but actually trying to use the Superbook is a very unpleasant experience. We definitely struggled to get V1 out the door, with delays caused by everything from our first manufacturer increasing their prices midway to inventory theft by our distributor to even the US-China tariffs. Without subjecting our backers to more delays, we shipped what we had as V1. No excuses. We are not satisfied by V1, our backers are definitely not satisfied by V1 and deserve to see the product improve. 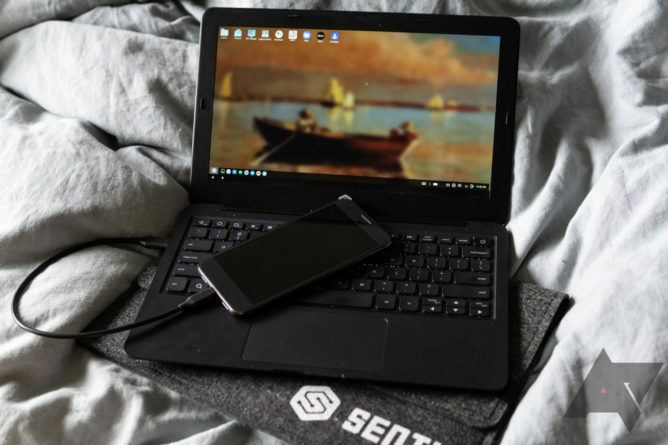 We are delivering firmware fixes to improve reliability of battery, the connection, as well as working through Android P which has a new implementation of freeform windowing. We will continue to ship software and firmware fixes to get Superbook V1 into better shape and hope we get the opportunity to make it right to the people who have supported our tiny dream back in 2016. 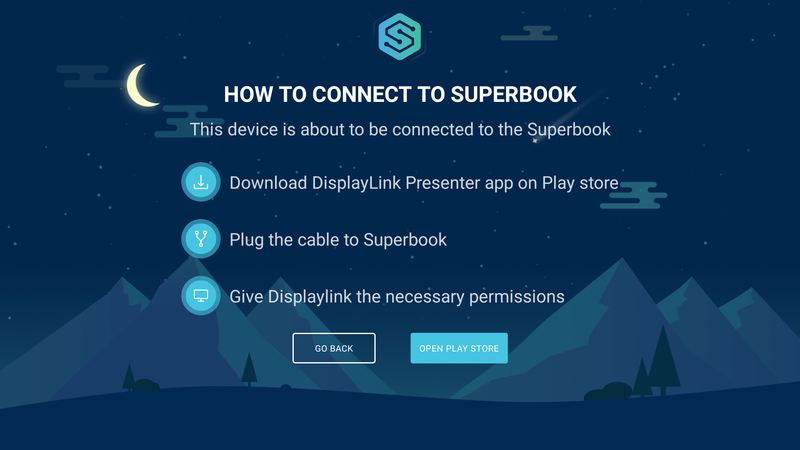 Interested parties can purchase the Superbook directly from Sentio.